A camera mounted to a police cruiser in St. Louis, Missouri has captured footage revealing a cop to have stopped its recording process, moments after realizing that it had filmed her colleagues kicking a man. Attorneys for the man caught being kicked have released the footage recorded from a St. Louis Police Department cop cruiser last year that they say is enough to prove their client was wrongfully arrested and abused by officers of the law. The dashcam footage released this week documents the moments leading up to the April 10, 2014 traffic stop that ended with 18-year-old Cortez Bufford being dragged from his automobile and repeatedly kicked by police officer and stunned with a Taser. Yet while much of the altercation is indeed caught on film, not every moment of the ordeal managed to end up on tape: Attorneys for Bufford gave the dashcam footage to local media, in turn revealing that a St. Louis Metropolitan Police Department officer warned her colleagues after the onslaught that the camera had been rolling, then seconds later she stops the recording. “Hold up. Hold up, y'all. Hold up. Hold up, everybody, hold up. We're red right now, so if you guys are worried about cameras, just wait,” SLMPD Officer Kelli Swinton is heard saying in the tape. Officers Nathaniel Burkemper and Michael Binz pulled over Bufford’s silver Ford Taurus moments earlier when they allegedly witnessed the teen executive an illegal U-turn in an automobile that matched the description of car that was sought in connection with recent reports in the area of shots fired. 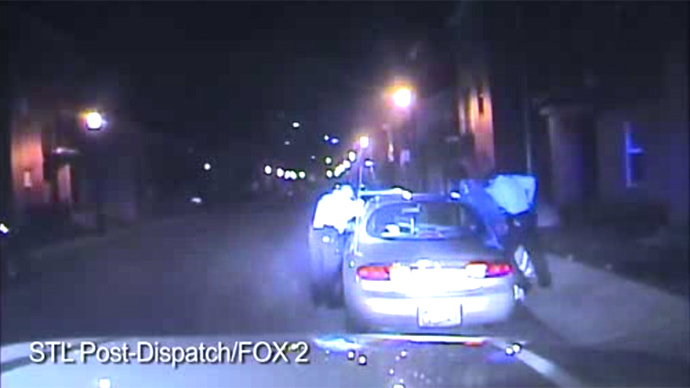 The dashcam footage shows one of the officers remove and then handcuff a passenger while the other engages with Bufford, who remains behind the driver’s seat. Video footage from the cops’ patrol car shows that three officers were involved in removing Bufford from the car, and a total of seven are soon after seen swarming the teen and restraining him to the ground, shooting him with a Taser and kicking him repeatedly in an attempt to keep him under control. Police did recover a gun from Bufford, but could not determine whether it was involved in the incident from earlier in the evening. Nevertheless, he was hit with a felony count of unlawful use of a weapon and a misdemeanor of resisting arrest. Three months later, however, those charges were dropped. Joel Schwartz, a lawyer for Bufford, told the Post-Dispatch that prosecutors dropped the charges against his client last August because the dashcam recording contained footage that contradicted details from the official police report. Schwartz and his colleague, Bevis Schock, have since filed a suit against the city police department, however, because they say Bufford never needed to be pulled over. “Schwartz maintains that Bufford should not have been stopped: that the car was not logically connected to the shots, the U-turn was legal and the driver is seen pulling to the curb using his signal in response to police lights,” Robert Patrick reported for the Post-Dispatch. According to a local Fox News affiliate, disciplinary action was recommended against Swinton, but the officer is appealing. The White House, meanwhile, recently announced that it wants Congress to allocate a quarter of a billion dollars in order to provide police departments across the nation with body cameras and specialized training in the of recent episodes that have raised concerns about officer accountability. Schwartz originally told the Post-Dispatch that he believed city officials refrained from releasing the dash cam footage for so long so as to not cause more unrest in Missouri, where the officer-involved shooting of unarmed teen Michael Brown last August spawn a wave of anti-police brutality protests. According to Fox 2, however, a chief of staff for St. Louis Mayor Francis Slay later told the network that the decision to withhold the tape had nothing to do with last year’s fatal shooting in Ferguson, MO.